A world away from shabby-chic the 61 rooms & suites at Ellenborough Park are rich in comfort and luxury and have been designed by Nina Campbell. Expect comfy armchairs, panelling and a contemporary take on traditional British style. Hypnos beds, underfloor heating in the en-suite bathrooms and Nespresso machines are just a few of the luxuries you'll find in all of the rooms.Cots are available and extra beds can be added for a small charge in the larger rooms. There are designated pet-friendly rooms. Complimentary WiFi, water and fluffy bathrobes are provided in all of the rooms. The Cosy Doubles have an en-suite bathroom with underfloor heating and luxurious bath and body products. 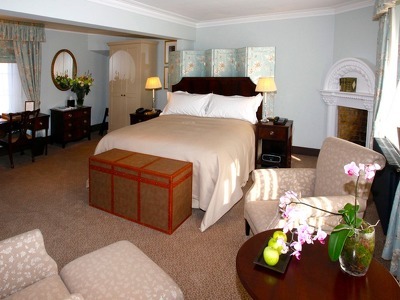 The Traditional rooms have an en-suite bathroom with underfloor heating and luxurious bath and body products. 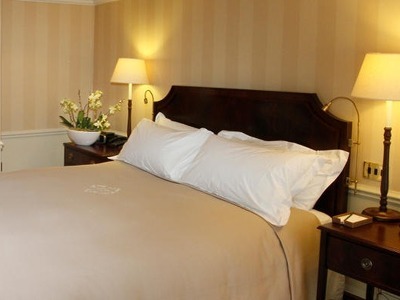 The Classic rooms have an en-suite bathroom with underfloor heating and luxurious bath and body products. The Deluxe Doubles have an en-suite bathroom with underfloor heating and luxurious bath and body products. 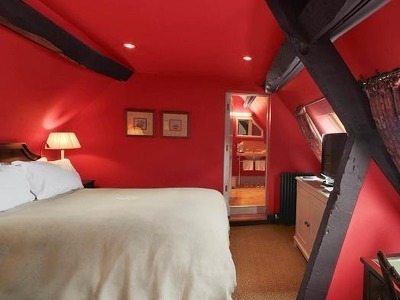 Some of these rooms have a private terrace, four-poster beds or roll top bath. 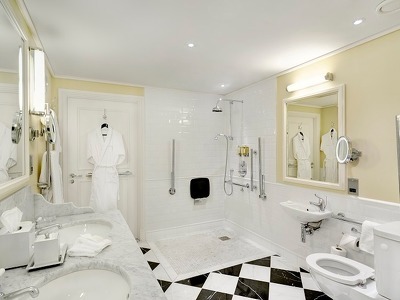 The Luxury rooms have an en-suite bathroom with underfloor heating and luxurious bath and body products. Some of these rooms have private patio’s, four-poster beds or roll top baths. The Open Plan Suites have an en-suite bathroom with underfloor heating, roll top baths and luxurious bath and body products. All rooms have original fireplace and beautiful views. Accessible Double rooms are equipped with a double bed and have a wet room with rails, pull cords next to the beds and lift access to room. Accessible Twin rooms are equipped with two single beds and have a wet room with rails, pull cord next to the beds and lift access to room. Ellenborough Park is a 61 room luxury hotel in the Cotswolds that consists of a group of honeystone buildings set around an historic Cotswold manor house which dates back to the early 1500s. Just 2 miles from the Regency city of Cheltenham, Ellenborough Park has its own private track through the grounds to the Cheltenham racecourse entrance. 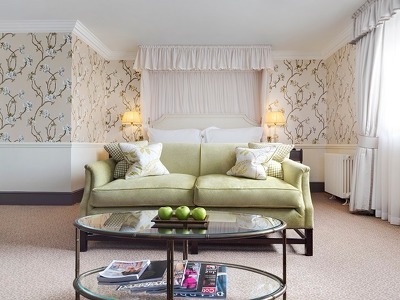 Recently refurbished by Interior Designer Rachel Eaton, the fresh interiors enhance the hotel's rich heritage, luxury image and will appeal to guests of all ages. There's an all-year-round swimming pool and an extensive spa and plenty of space to absorb weekend weddings and midweek business meetings so that other guests barely notice. Very family-friendly and dogs are welcome in certain rooms. The service is excellent at Ellenborough Park and provided by an enthusiastic and knowledgeable local team who go the extra mile; binoculars, jackets and Dubarry outdoor wear are lent to guests at the drop of a hat. Revitalised and refreshed, the bar area now features an extensive and eclectic choice of drinks including Ellenborough Park's very own gin. Cocktail lovers should find their way to the Atrium, a stunning new cocktail bar, and the trendy place to be during Cheltenham Gold Cup week. Dogs and their owners can head to The Horse Box, a dog-friendly dining option, open 7 days a week. Designed in the style of a country pub it has a relaxed, cosy feel and is the perfect place to stop after a long country walk. If you're after a special dining experience, head to the brand new restaurant which is accessible to everyone and brings Ellenborough Park into the 21st-century. The restaurant is closed on Monday and Tuesday evenings. Dogs are only allowed in certain room types. The Restaurant is closed on Monday and Tuesday nights. All diners in the hotel will have access to The Horse Box, which will have a specials menu available. 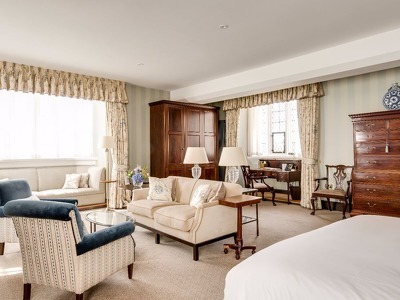 A world away from shabby-chic the 61 rooms & suites at Ellenborough Park are rich in comfort and luxury and have been designed by Nina Campbell. Expect comfy armchairs, panelling and a contemporary take on traditional British style. Hypnos beds, underfloor heating in the en-suite bathrooms and Nespresso machines are just a few of the luxuries you'll find in all of the rooms. Cots are available and extra beds can be added for a small charge in the larger rooms. There are designated pet-friendly rooms. Complimentary WiFi, water and fluffy bathrobes are provided in all of the rooms. Simply the best option for an afternoon tea in Cheltenham. Purchased 4 vouchers for my family and wow what a great experience. The food was exceptional, the service second to non and the environment just stunning. At £25 per head, probably the best value for money when you see what you get. Brilliant location. Terrific for office conferences as well as leisurely weekends away in the beautiful rolling countryside around Cheltenham. Highly recommended. Friendly and professional staff! The rooms were exceptional and clean! Richard is one of the best managers at the site along with Bryan. I highly suggest staying here. 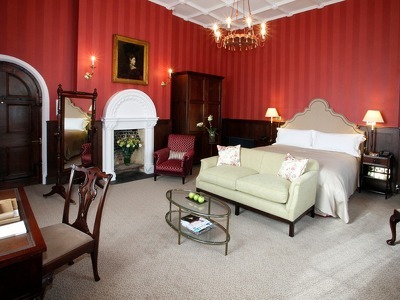 Stunning hotel, beautiful location, lovely mix of old and new, great service and lovely, spacious room. Restaurant served good food in a nice setting. Spa was brilliant, great facilities and very relaxing. Spa was good but a bit small for the size of the hotel. Jacuzzi and steam room were sometimes too warm. Food fantastic, had both dinner and breakfast. Great selection on the continental.